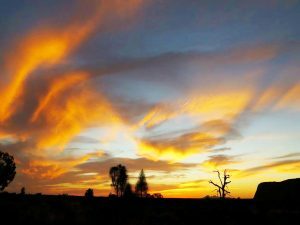 It’s no secret that Central Australia is home to some of the best Sunrises and Sunsets in the world. Today we’re going to give you sa couple of tips on where to get that great sunset photo!! This lookout is a popular spot amongst backpackers. This is because its located next to the coach campground. Having said that most backpacker tour groups go to the national park at sunset so this location is usually pretty quiet around sunset. Ewing Lookout is a great spot for photos because it boasts stunning vistas in all directions. It is an ideal location to get that great photo of either Uluru or Kata-Tjuta. Chances are that there will only be a few people at this location at sunset too as it’s located away from the main resort. The sunrise viewing area in the Uluru-Kata Tjuta National Park may seem like an odd place to go for a great sunset photo. It is however quite amazing. At sunset everyone flocks to the sunset viewing area, this leaves the sunrise viewing area a very quite place with only a few people taking in the alternative view. It also provides a great setting for a fantastic photo. A winning shot of the sun setting between Uluru and Kata Tjuta is awaiting at this location. These two spots are often overlooked. The good news is though, with a backdrop like Uluru, any location is a great spot for a photograph.